Hard to believe, but I initially wasn’t the biggest fan of Pilates in when I took first class in 2010. It wasn’t until I tried the reformer in 2013 that I realized how much the reformer machine actually provides assistance (and resistance) to achieve proper alignment and good results. A new job just outside of San Francisco forced me to try out new Pilates studios and I’m very happy to find Mint Studios (aka “Mint”) in the SOMA district of San Francisco. I’ve been there for almost two years now! If you follow me on Instagram, you will know that I love Pilates, especially the Power Pilates Reformer classes taught at Mint. Note that Mint offers barre, yoga, and mat Pilates as well, but this review will focus on the reformer, particularly Power Reformer class, which is my favorite service they offer. …not that those services are bad, but perhaps just not want I personally need. Keep in mind, when I hopped around town for different studios, I realized my favorite teachers really knew how to fire up different body parts to help me feel the burn. Certain studios or teachers offered a style of Pilates reformer that was simply not challenging enough for me. 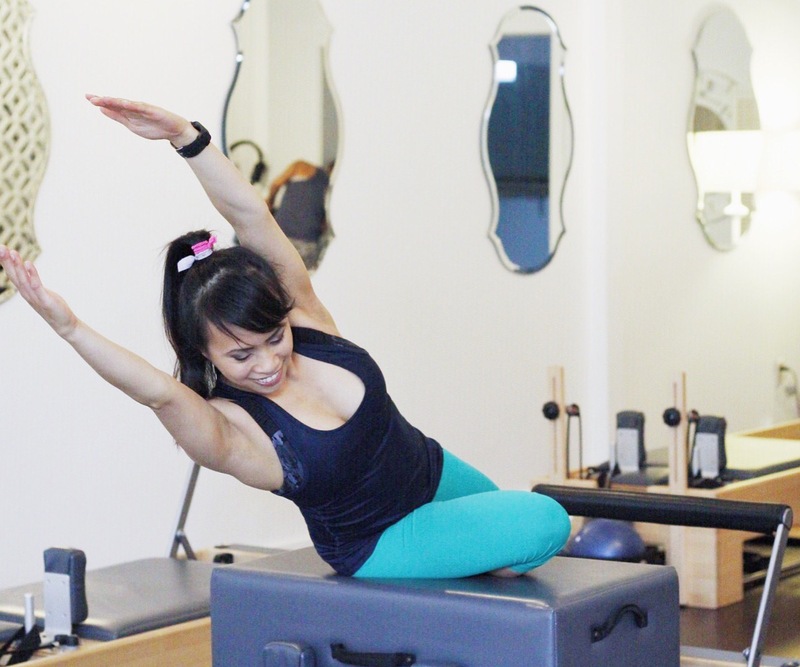 I love Power Pilates (and Cardio Reformer) at Mint because of how they take classical Pilates, and throw in other exercies or offer variations that are more athletic in nature. This helped me get results faster. (For example, people constantly ask me how I get my arms toned. Truth is, although I can lift relatively heavy weights for my size, I attribute my strong, but not-so-bulky arms to practicing Pilates! And here, at Mint, the instructors help you find those small muscle groups, which results in long lean muscles! The class typically starts with a warm up stretch, followed by a exercises that target the legs, obliques, arms, and core. Core exercises is what Mint does best. I am not a fan of ab work done while lying down on my back. My lower back hurts, my hip flexers start to fire up, the teacher says “shoulders up’, but I feel like my petite torso doesn’t allow my upper back to lift up that high. Hot mess, I know. But Mint’s methods really force me to find those deep muscles to build core strength. The instructors provide very detailed instructors on what apparatus to use, where to position yourself, and what the movement should be. They are very nurturing with their clients, but know how to take it up a few notches simply by offering advanced moves, longer holds, or spending more time in the movements. Please note that socks are required. I believe they prefer grippy socks, which they sell at the front desk should you forget a pair. I’m not sure what station or playlist they use, but it’s generally dance or pop music from today and even some throwbacks, so I enjoy it since that is what my playlists are made up of as well! The instructor typically asks if there are any requests we have, and they’re flexible enough to throw it in. I always ask for core because I just won’t do it myself, but a good chunk of class focuses on core, so we are covered. Because there are only six reformers, the instructors can make their rounds and provide corrections or modifications when needed. For the most part, the studio is never cold. I appreciate that. My muscles do not work well if the studio has their AC blasting. Classes are typically 50 minutes long with a warm up and cool down. I’ve taken 30 or 45 minute classical reformer classes elsewhere, and it just doesn’t feel like enough time to get my body warmed up. Because the instructors push me to work my core hard, I end up doing what I call a “pretty sweat” in most classes. I sometimes even position myself on one of the reformers closer to the fan. When I’m smart, I remember to bring in a small (yoga) towel. When it gets hot, the studio can sometimes get humid. But honestly, I’d rather be in a hot humid studio than freezing during a workout. There is a designated area for changing, but it accomodates only one. There is also the restroom, but I avoid hogging that in case someone needs to use the facilities. The Studio Director once let me change in the back room where the large group fitness classes take place. Note: if you are arriving there from work and need to change, arrive early to secure time in the changing room or restroom. Note: if you get ready for work at the studio, just be patient. There’s never more than three clients getting ready at once. No showers, but that is very typical of a Pilates studio. Not a deal breaker at all. Coming from a dance background, I initially wished they had large mirrors in the main reformer area. But I realize, given the small number of students in each class, mirrors aren’t necessary for me to check my form as the instructors do a good job of making adjustments. If anything, the lack of full-length mirrors helps me focus more on how the exercise should feel, versus how I look. Very important, I must say. Instructors: Just based on my availability, I typically take Carlie or Gabby, but I can safely recommend anyone else here because the studio owner, Elaine, takes pride in her team and trains them to master the athletic Pilates methods that Mint is known for. I truly do appreciate the relatively low attrition rate here at Mint. At other Pilates studios, instructors quit left and right. But at Mint, that is the last thing I worry about. Time: Varies during the day. I typically take the 7:30am class on a weekday, or some random Sunday mornings when I need to change up my schedule due to work or what not. Would I come back to Mint Studios? : Yes! Besides how great the workout is, I love the studio itself! Very feminine, which I love! Out of my 10 ClassPass bookings available in one cycle, how many bookings would I use at Mint Studios for each cycle? : I always try to max out my three visits each month, which works out given my work schedule. But I do sometimes supplement and drop in, or once, I tried a private class and love it – need to see when I can fit that in again. How social media friendly is this studio? How “instagrammable” is this studio? : Very. The owner clearly has an eye for design that I admire. The studio is bright and airy, which means that more likely than not, your photos will turn out fine. Their social media game is strong (especially on Instagram), so they do love it when you check in on social media. In terms of design, I love the chandelier in the main room. Love this accent chair in the lobby. Love the quatrefoil rug and the wall dividers with the laser cut-out quatrefoil terrace pattern. Quatrefoil is my favorite shape in case you didn’t know. 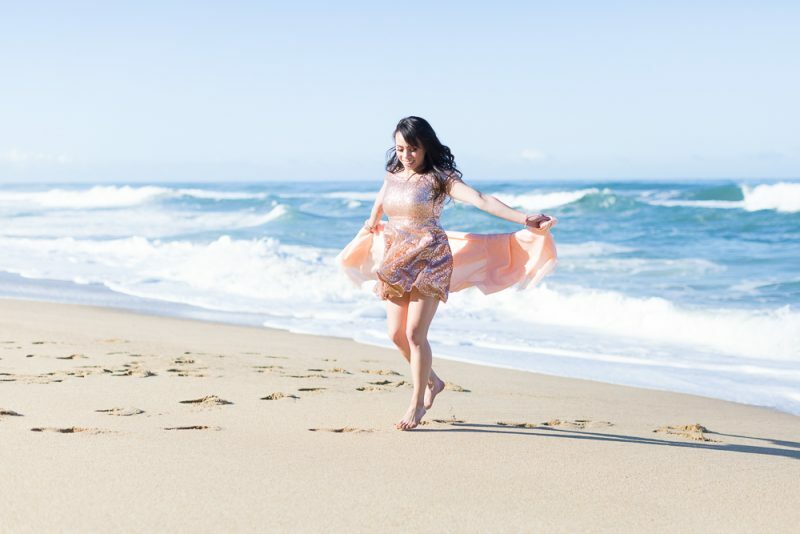 When to book: At the earliest, book a week out at noon PST. 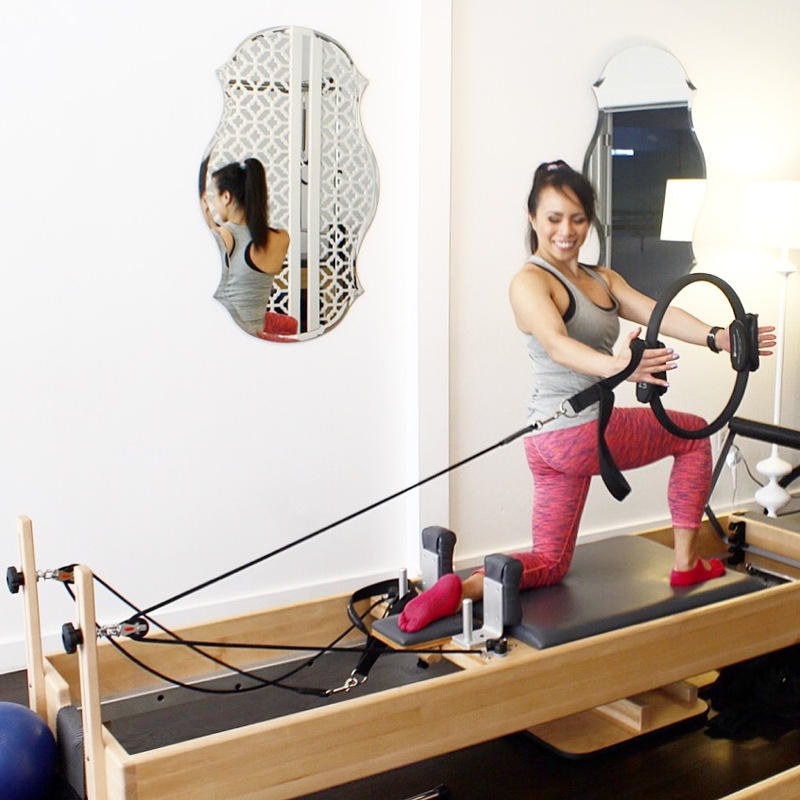 Due to the popularity of Reformer classes, spots might not always be available on ClassPass. Last-minute cancellations might open up spots on the ClassPass platform. The earliest you can book is 9pm PST the night before. Parking: Street (metered – I use the PayByPhone app); Note that parking does get tricky during normal business hours since quite a few tech companies are near by. Public Transit: I’m not familiar with the bus lines in San Francisco, but worse comes to worse, it’s a quick Uber ride. Etiquette: Take your shoes off upon entering the studio. There’s a shoe cubby for clients right upon entering the foyer. Cubbies to store your things in. No lockers, but the person at the front desk watches your things while you take class. Complimentary espresso – ask the front desk for help with the machine if you need it. They also have a small shop for branded clothing, bkr water bottles, and grippy socks. My first social media post at Mint! Wearing a cool racerback tank from lululemon – one of my fave workout tanks. Quatrefoil is my favorite shape! Love this rug! ‘Motion’ leggings by Alo (size XS) – no alterations as I like the leggings to cup my heels. On some days, Oona (@oona_sf) visits! She’s the quietest toy Austrailian Shephard. For months, I didn’t realize she sometimes hangs out at the studio with her owner, Carlie, the Studio Director! Outfit: Cool Racerbank tank in Pink Paradise by lululemon (size 4) – Yes, I had it altered to fit my torso. Complimentary alterations at stores; ‘Motion’ leggings by Alo (size XS) – no alterations as I like the leggings to cup my heels.